now it's Diving Draw + Circle Circuit. PokéStats is back with more results and analysis from Japan's tournament setting. The latest tournament in that land of XY-on was held in Yokohama this past weekend; the new Shining Legends set was legal for play. The most-used card from the new set was, without a doubt, Zoroark-GX. The combination of Empoleon DEX's Diving Draw and Raichu XY's Circle Circuit found a home in an astonishing 15 of the Top 16 decks and all 8 of the Top 8 decks, whether as a 1-1 support line or as a 4-3 main-attacker line. The Shadow Fox was paired most frequently with either Night March or Lycanroc-GX GRI, although the winning list was a less conventional Toolbox deck featuring some other new and unusual cards. Below I'll give the Top 8 lists and address a few points of each list that I believe are noteworthy. 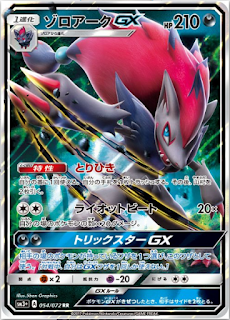 At the end of the article I'll look at how previous Japanese powerhouses translated to success in the rest of the world, and predict what effect Zoroark-GX might have on the meta outside Japan. Shining Genesect: this is really interesting. For those who don't know what the card does, its Ability allows you to move 1 [G] Energy per turn to it from 1 of your other Pokemon, and its attack is simply Secret Sword (50 + 20 for each [G] Energy). The card is supposedly a combo with the new Energy-multiplying Venusaur, but in this deck it seems to be a counter to Pokemon with Grass Weakness. This would have been very useful against all the Lycanroc-GX in Top 8: one [G] Energy and a Choice Band would OHKO Lycanroc. Seismitoad-EX is also played pretty often in Japan still, so there's another matchup this card could improve. 1 Necrozma-GX and 1 Tapu Koko SM30/31: We know spread damage decks have been huge recently (Alolan Ninetales-GX, Decidueye-GX, Garb Toolbox, Weavile...), so it makes sense for this deck to capitalize on the trend. Zoroark and Lycanroc can't hit numbers above 200 with ease, so softening up Gardevoir/Metagross/whatever is key to this deck's ability to stream KOs. 1 Tapu Lele SM45: This card seems like a near staple in any deck with Rainbow Energy. The power to manipulate damage counters on your opponent's board is incredible. 1 Oricorio GRI 56 and 1 Sudowoodo GRI: basic counter cards that have some degree of utility in almost every matchup. Many Top 8 decks in Yokohama played Sky Field, making Sudowoodo especially relevant. 1 Mimikyu: another good card in Psychic/Rainbow decks, Mimikyu can serve as a retaliation card if you want to copy an opposing attack or don't have a main attacker powered up to respond to a knockout. UPDATE: Turns out the official website made an error - the Wobbuffet is actually the Bide Barricade one and not the useless BSH one. Makes a lot more sense, doesn't it? Thanks to @tellu_poke on Twitter for clearing this up. Just like with Pokemon, there's a big variety amongst the Supporters in this deck. The most interesting to me is Mallow. Keep in mind that Shaymin-EX is still legal in Japan, providing a great draw combo with Mallow; however, this list doesn't actually play any Shay, making Mallow's inclusion a bit of a mystery to me. Mystery Energy is another slightly head-scratching inclusion over 2 more Rainbow Energy or even some kind of basic Energy. I'd much rather have more Rainbow to ensure I could use Shining Genesect's attack or Zoroark-GX's GX move more easily. Shintaro Ito, if anyone forgot, is the M Audino-EX guy from Worlds 2016. He's been on a tear in Japan recently after his Worlds win, topping multiple Regionals and earning a Day 2 invite to Worlds in 2017. 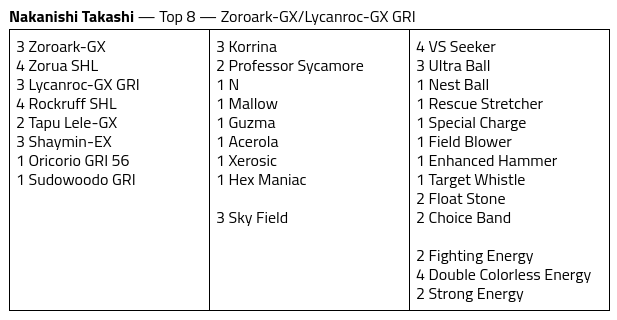 Interestingly, this is the only Top 8 list to play a copy of "baby Zoroark" (Zoroark BRT) alongside the GX. Baby Zoro likely has utility in the mirror when your opponent is stacking their bench to power up Riot Beat; you can swing for a KO while only putting a one-Prize attacker in harm's way. Alolan Muk was hyped when it was first revealed but has never really been played. We might be entering an era at last when it is playable, as plenty of decks want to use their Evolution Pokemon's Abilities but are OK with turning off those of Basics. As Tapu Lele-GX has become the premier consistency card with the rotation of VS Seeker (outside of Japan), Muk has the power to really hurt the consistency of these new decks. Power of Alchemy, unlike Garbotoxin, has the additional advantage of not being disabled via Field Blower. Speaking of Tapu Lele-GX, I think it's extremely telling that both finalists are the only ones of these Top 8 decks to play more than 2 Lele. Consistency is always huge. Note the copy of Target Whistle; the card is a fantastic combo with Lycanroc-GX's Ability. Item-, Supporter-, and Energy-wise, this list is standard Night March; the interesting parts are in the Pokemon and Stadiums. Milotic hasn't really been played in Night March since Puzzle of Time was released and provided a recovery method that returned more cards, didn't take up a Bench spot, and wasn't worth a Prize. Suzuki's list runs all 4 Puzzles and a 1-1 Milotic line, which just gives it that extra bit of consistency and recovery outs. Another thin line is the 1-1 Zoroark-GX, which is reminiscent of the earliest Night March lists back in 2015 that would often play Archie's Empoleon to draw through the deck more smoothly. This list foregoes Dimension Valley entirely in favor of 1 copy of Parallel City. Parallel is an overlooked card in this format that has a lot of utility, but cutting out D-Valley is unusual because it effectively eliminates an attacker (Pumpkaboo) from the deck. That being said, Psychic-types aren't played much at the moment (except Garbodor, which is easily OHKOd regardless of Weakness), so this decision does make sense. Kubo's list looks more similar to a traditional Night March list such as this one that Michael Pramawat just used to win Fort Wayne Regionals. Gone are the Milotic line, Giratina, second Lele, and Parallel City; in their place are 2 Trainer's Mail, a beefed-up Zoroark-GX line, and a single Dimension Valley. 2 Fighting Fury Belt is an interesting choice, but Night March still plays a handful of Pokemon (Lele, Shaymin, Joltik, Marshadow) that can benefit from some extra HP. The following lists are all similar to the Zoroark/Lycanroc or Zoroark/Night March lists discussed above, so I won't go into detail on them. Two things to note are the 1-1 Flareon lines in two of the Lycanroc lists, and the varying Supporter counts (Korrina-based support vs. Sycamore-based support). What does Yokohama's meta say about the impact of Shining Legends on the rest of the world's format? Japanese results in the past year have been surprisingly good at predicting what cards will succeed elsewhere. Gardevoir-GX, Golisopod-GX, Drampa-GX/Garbodor, and Trevenant/Necrozma-GX are all decks that saw lots of play in Japan before they took down events in the rest of the world. 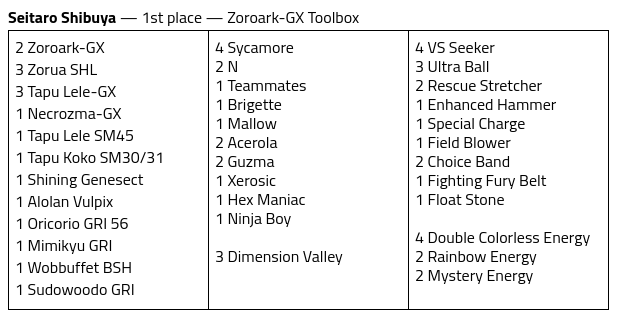 If 15 of the Top 16 decks at Yokohama played Zoroark-GX (which is incredible if you stop to think about it, putting Zoroark right up with "staple" Pokemon like Shaymin or Lele), it's safe to predict that the competitive scene around the world will embrace Zoroark as well. 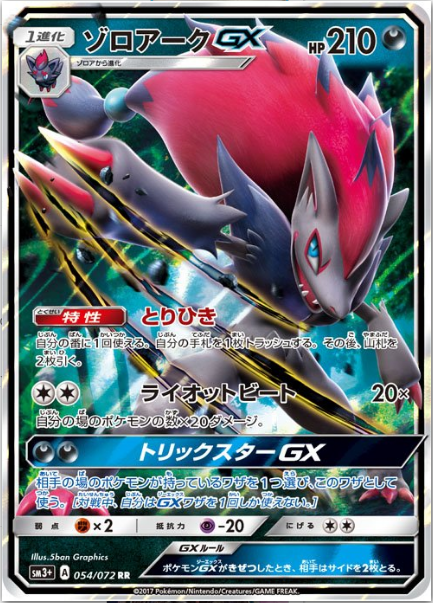 Whether it's paired with Lycanroc in Standard, Night March in Expanded, or some other new concept, it seems clear that Zoroark-GX is one of the strongest GX cards yet and the format will change accordingly. Lycanroc can't just be a Korrina thing can it? I realise we have the gust effect but it seems nuts to me that it seems to do so well in Japan but almost never elsewhere. If you have a Zoroark GX on your bench, a Mallow supporter is effectively discard a card to search out two cards in your deck!